13 May 2017....... Halifax Town v Choley National Conference North Play-off Final at the MSI stadium Halifax. 'Halifax manager Billy Heath celebrates promotion after winning 2-1 after extra time. Picture Tony Johnson. Even if the Town players and fans stopped believing at the turn of the year, Billy Heath and Mark Carroll’s conviction never wavered. 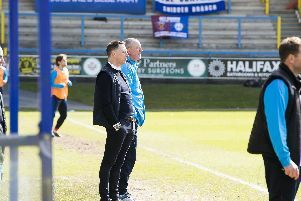 The Town squad would have been forgiven for greeting Heath’s proclamations of promotion after defeat at Stalybridge on January 7 with scepticism. That result made it nine without a win for Heath’s team, a run which saw them knocked out of the FA Cup and FA Trophy and their league form and performances deteriorate alarmingly. But belief and hard work are the two central tenets of Heath’s managerial style, so when asked if there had ever been a point in the season when he stopped believing promotion would be achieved, Heath unsurprisingly replied: “No. I’ve been doing this a long time and I’ve earned my stripes. I know what it’s all about and you just keep believing in what you’re doing because we’ve won things doing it that way. For Heath and Carroll, this season’s promotion represents a different kind of success, achieved under a scrutiny and pressure from supporters not experienced at previous club North Ferriby. “It’s enjoyment, satisfaction, it’s relief because the tension is high for everybody in a play-off final,” Heath said when he asked how he felt about the promotion. “You believe in what you do and I’m not fazed by anything, I’ve been around too long. “We have confidence in what we do and that’s why we’ve won the trophies we have, because we know exactly what we’re doing. “I’d had a settled team for three or four years at Ferriby, so this has given me a major satisfaction because I don’t think people appreciate the fact we had six players at this club when we arrived. That is not a good position to be in. “Two of those were long-term injuries, so we were like ‘we’ve got four players!’. “We were already four weeks behind. People will point to the fact we took seven from North Ferriby but if you look at the stats, they’ve not all played together because we’ve had a lot of injuries, so it’s not like we had a nucleus of a team there. “And you’ve got the relegation hanging over your head as well.